Electri6ity’s Performance page gives you access to the most important playback settings. Guitar pickup, volume, strum behavior, vibrato, and release behavior are all included in this page. You can adjust the pickup location, the tone, and release volume. 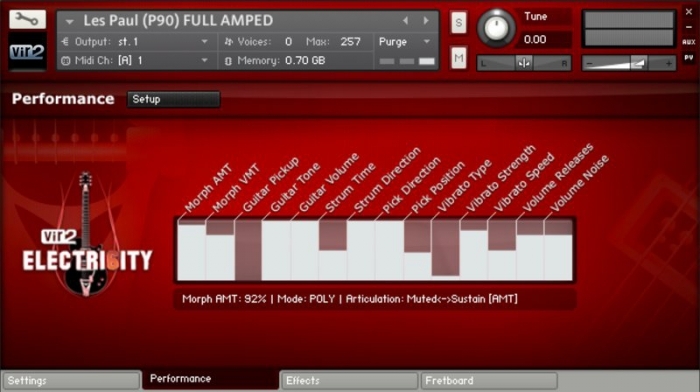 The Performance Page also utilizes the most advanced scripting to date, including the revolutionary Articulation Morphing Technology (A.M.T) and Velocity Morphing Technology (V.M.T. ), allowing for the seamless morphing from dead mute to sustain or from soft to loud. With unparalleled control, the Settings page places every nuance of a guitar in the user’s hands. Control the Strings, Fretboard, Tone, Legato, Strumming, Picking, Noise, Humanizing and much much more. 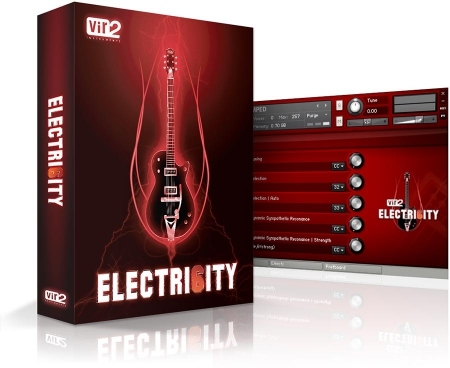 The philosophy of Electri6ity is to make a virtual guitar and the Settings page is the heart of this goal. Take the powerful sounds of Electri6ity and elevate them to another level! 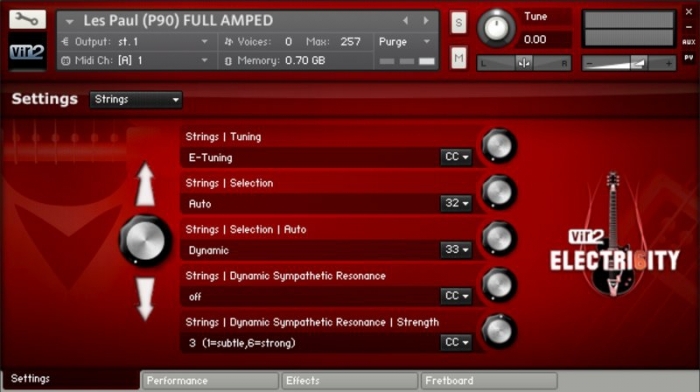 Add FX and chose which style of amp to send the guitar through. Offering Jazz, Classic, Clean, Metal, and more one can chose different miss and how much reverb to add. 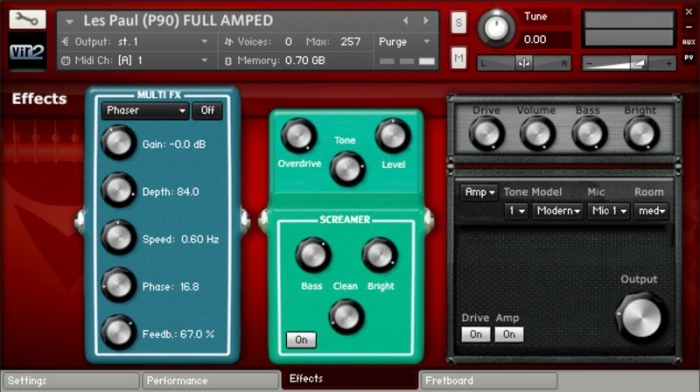 Add drive for full, crunchy sound or use the EQ to shape the perfect tone. 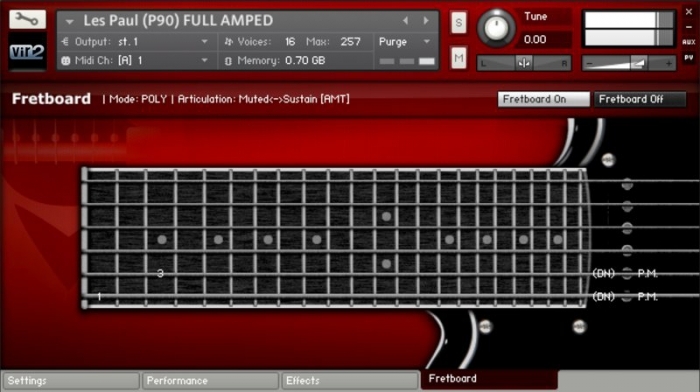 The Fretboard displays the location of where a sample is triggered. The playback displays in tab form for easy interpretation of chords and notes. Additionally, one can see the picking direction and determine which performance setting sounds best. The ability to see the guitar in action offers a truly immersive experience.